Wondering if it’s too late to jump on this market recovery? I have great news: it absolutely is not. 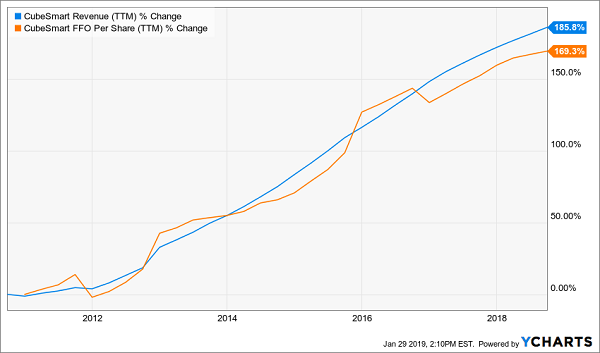 But you won’t reap the biggest gains by, say, putting cash into your typical S&P 500 name—or in a passive index fund like the SPDR S&P 500 ETF (SPY). Because while rising corporate profits will likely propel the market higher this year, you’ll put yourself in a much better position by hitting out at the two sectors (and two specific buys) I’ll reveal now. Both sectors will be on my personal list this year, and I’ll be recommending stocks from each one to members of my Contrarian Income Report service, too. Real estate investment trusts (REITs) are famous for high dividends, but the one I’m going to show you today is in another league. It pays an already-decent 4.2% dividend now. And thanks to its strong dividend growth, a yield on your original buy will likely soar to double digits in short order—just like the lucky folks who bought 10 years ago—they’re yielding an amazing 34% on their original buy today. First, the stock I’m talking about is CubeSmart (CUBE) a hidden gem in the ignored self-storage space—a business so boring it would make even the most conservative investor sleepy. 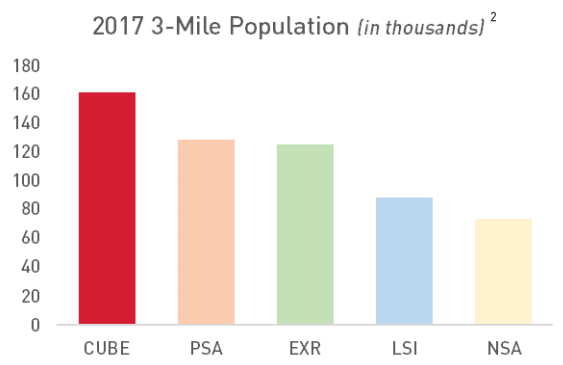 In fact, CubeSmart is far from alone in lagging VNQ: all six publicly traded self-storage REITs have done so this year. That’s partly due to worries that there are too many of these handy little mini-garages spread across the US. To be honest, that’s always a risk in a business like self-storage, which has fairly low barriers to entry. The other safety valve? The company runs more than half its locations through deals with outside owners. That gives it steady fee revenue and cuts its risk. That leads us back to CUBE’s spectacular payout growth: the quarterly dividend has spiked 1,180% in the last decade! So if you’d bought in 2009, you’d be yielding an amazing 34% on your investment now. This dividend is almost certain to keep rising, helped by CUBE’s low (for a REIT) payout ratio: just 73% of FFO. And thanks to the overwrought negativity around self-storage REITs we can grab this one for just 18.5-times trailing-twelve-month FFO. A great deal. CUBE isn’t the only discounted dividend left over from the selloff. You’ll find more in the too-often-ignored preferred-share space—and I’m about to reveal the perfect “one-click” way to profit (paying a fat 8% cash dividend every month, to boot). Preferreds are the best-kept secret in investing: they look a bit like stocks (they can trade on a market, for example) and a bit like bonds (they trade around a par value and send out a fixed regular payment). The best thing about them: outsized payouts! Which is why preferreds took a licking last year, as first-level investors fretted that rising rates would sideswipe them. But now, with the Fed likely to take a breather, the pressure is off. 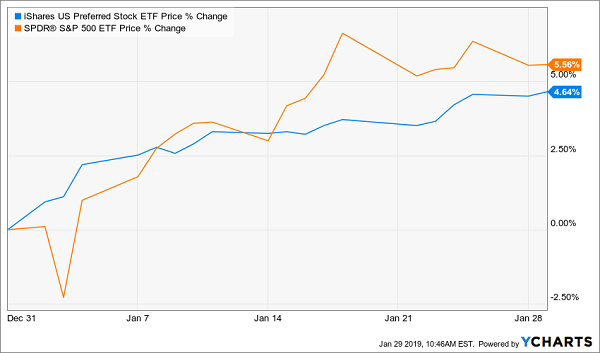 The herd knows it, too: they’ve sent the passive iShares Preferred Stock ETF (PFF) up nearly as much as the S&P 500 since January 1. 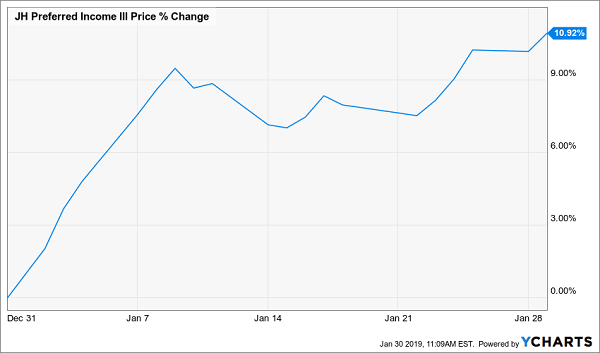 But don’t worry, you can still get a deal in this space, thanks to the John Hancock Preferred Income III Fund (HPS), a closed-end fund (CEF) boasting a “hidden” discount that’s leading us to serious upside in 2019. So what is this discount, and why do we say it’s hidden? Right now HPS trades right around par, and the gap has narrowed from 1.5% earlier this year. That may not sound like much of a move, but it’s helped catapult the fund’s price up an amazing 11%. 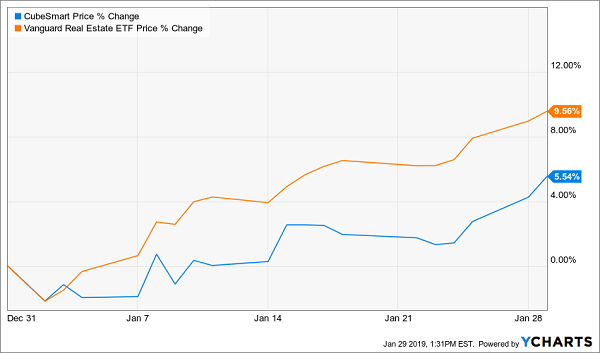 This is how powerful a narrowing discount to NAV can be in CEFs, and HPS is just getting started. How do I know? Simple history. Consider that the last three times HPS’s discount turned into a significant premium (here I’m talking 1.7% and above) fell in September, October and November 2018—all times when rate-hike fears were at their wildest! But now that the Fed has shifted into park, the runway is clear for HPS to soar to even bigger premiums (and more price upside). Let’s get in now and start tapping its outsized 8% monthly dividend while we prep for its next leg up. 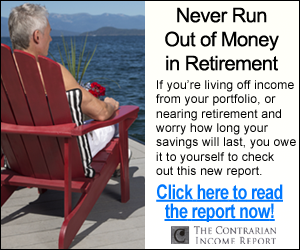 Last Friday, I released my very best high-yield buy now to paying subscribers of my Contrarian Income Report service. And I want to give you this fresh pick now. This little-known high yielder is cheap, but it’s already starting to inch higher, so you’ll want to make your move soon. 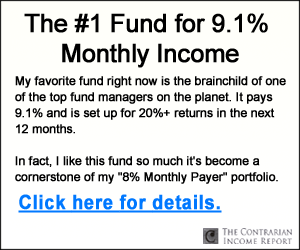 You can get instant access to Contrarian Income Report—and this latest pick—when you click right here. That’s not all, because you’ll also get—in just a couple clicks—the other 20 stocks in this service’s portfolio, which throw off an amazing average payout of 7.6%. And that’s just the average! Four of these cash machines pay over 9% … and one even delivers a monstrous 12.4% cash dividend! The best part? Nine stocks in this powerful 21-buy package send out cash dividends every single month. That helps steady your income stream and, of course, matches up perfectly with your monthly bills. I can’t wait to share all 21 of these stocks with you—including a free special report spotlighting the 3 very best monthly payers for your portfolio now. Click here to get the whole package: your 21-stock portfolio (with safe dividends up to 12.4%), my very latest (just three days old!) monthly high-yield pick and your free report, with my 3 best monthly dividend stocks to buy now.